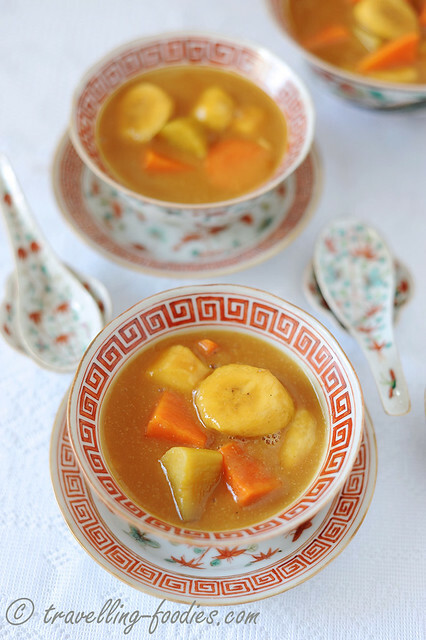 Pengat Pisang, as the name implies has its roots in traditional Malay cooking. A “pengat” is essentially a sweet broth with the addition of coconut cream in the last stages of cooking. 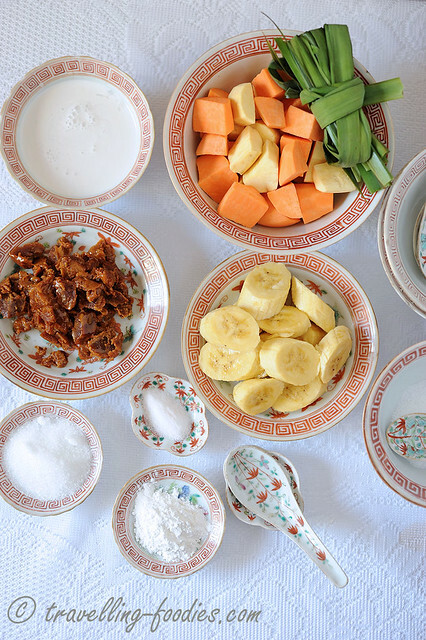 For the peranakans in Malacca and Singapore, pengat is almost always cooked with gula melaka while in some communities in northern Malaysia, white granulated sugar (gula pasir) is mostly favoured. 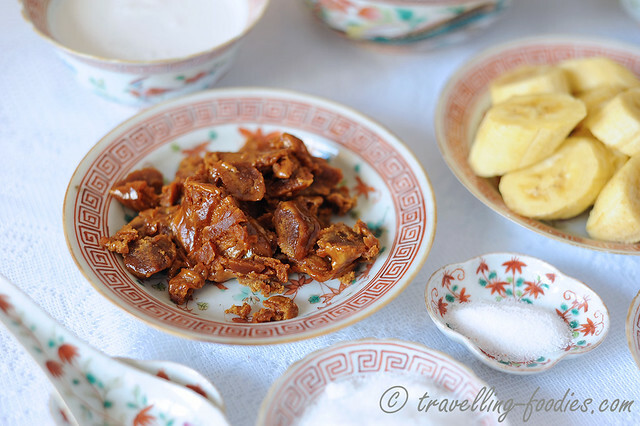 For example in Kedah, pengat is cooked with white sugar and bijik sagu is often added for textural contrast. This “white form” of pengat which some folks call “pengat putih” is said to be one of Tunku Abdul Rahman’s favorite desserts incidentally. For the Peranakans, pengat is a must on the 15th day of the first month of the lunar calendar. Known more popularly as “Chap Goh Meh“, this day marks the end of “taon baru cina” or Chinese New Year, which began during “Tang Chek” or Winter Solstice when another popular desert, kueh ee was served as an offering for the gods, as well as for the enjoyment of the family. As such, the beginning and the end of the two month-long preparation and celebration are both marked by a feast of chuchi mulots. And for the Peranakans who are notoriously known for their sweet tooth, this cannot be more apt! However, it seems like over the years the practice of serving pengat on Chap Goh Meh seems to be waning, while a somewhat similar yet remarkably different dessert Bubor Cha Cha seems to be gaining favour and popularity. Let’s hope that it would not be entirely forgotten over time. The ingredients for cooking pengat are pretty standard. Santan and gula melaka are what basically constitutes the “kuah pengat” and thus indispensible. And whenever coconut milk appears in a dessert recipe, it seems inevitable for pandan leaves and salt to make their appearance, the former to add aroma while the latter balances the flavours. A small portion of white granulated sugar is added for maintaining sweetness without having to add too much gula melaka which can get rather cloying. 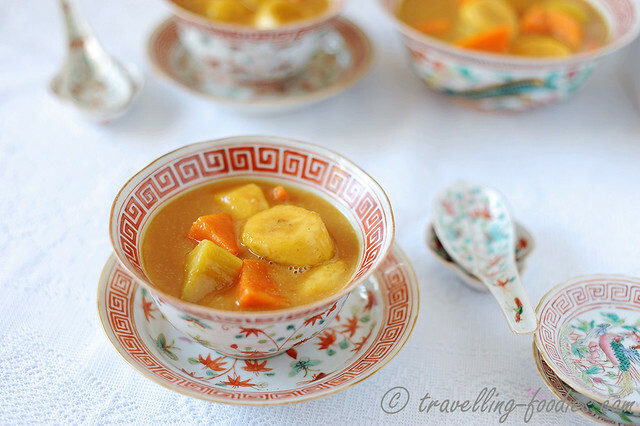 The bananas used in pengat de factor are pisang rajah, much loved for their sweetness and ability to stay in shape and not get too mushy upon cooking. That said, the bananas are cooked very very briefly, if not at all. Otherwise, pisang mas or pisang berangan make excellent alternatives as well. Just stay away from the Cavendish bananas. 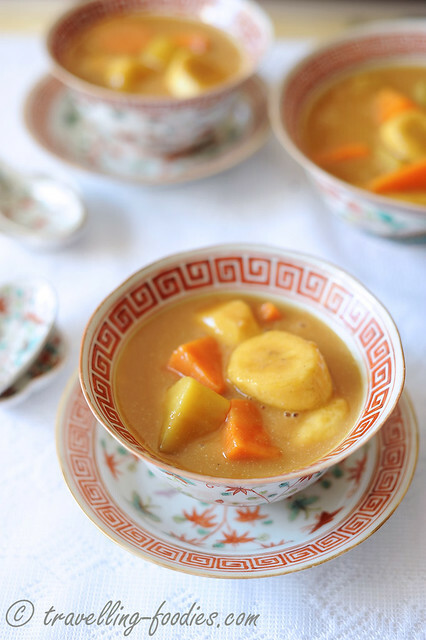 Apart from bananas, a selection of root vegetables are also added to enrich the pengat. The usual suspects would be kledek (sweet potatoes) and keladi (taro) while I’d also seen folks cook pengat with labu (pumpkin). Less authentic which would put a frown on those Peranakan purists of course, but I’m sure it is no less delicious. 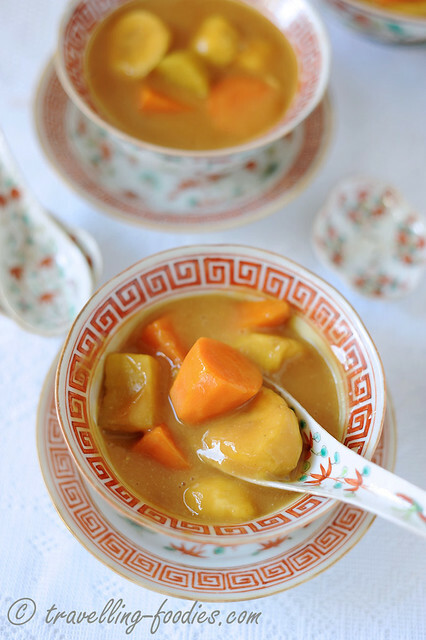 There are two ways to cook the root vegetables for pengat. One is to cook them in a sweet broth until they are nicely soften before adding gula melaka and later coconut milk. The one steams the cut up root vegetables separately and add them into the prepared kuah during assemblage. Both methods are acceptable and work well for pengat though the former is better for those who prefer less hassle. The choice of gula melaka is of utmost importance in this simple dessert. As I had already shared in the post for Apom Balek, good gula melaka should （1）be soft to cut and even to pinch off, (2) exude a beautiful and mellow aroma, (3) taste pleasantly sweet with a sense of richness and depth, (4）have a uniform coloration when sliced through without the core looking paler. In short, good gula melaka should excite and invigorate your senses. Add water into a deep saucepan, add gula melaka and heat to melt the gula melaka to form a syrup. Strain the syrup to remove any impurities and pour back into the same saucepan after rinsing slightly. Add thinned coconut milk, granulated sugar, salt, bundle of pandan leaves and sweet potato chunks. Bring to a boil, lower flame and cover with lid to cook until sweet potatoes are nicely soften. Adjust sweetness with more sugar or salt if necessary. If desired, add flour and water mixture at this moment and stir until the consistency thickens slightly. Turn off flame and add in sliced bananas. Stir in the thick coconut cream at this moment as well. Cover lid and leave the pengat to steep in the saucepan over the stove for around 5-10 min. 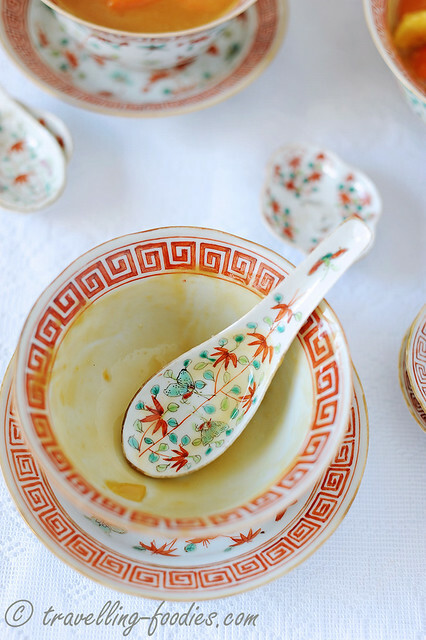 Remove pandan leaves, ladle into dessert bowls and serve immediately. *Note: the consistency of the kuah pengat varies from family to family and of course with individual preference. Some folks do without a thickening agent and prefer a more “cair” kuah while others love theirs really “pekat“. Durian pulp can also be added in place of bananas for pengat durian. This entry was posted on April 20, 2015 by Alan (travellingfoodies). It was filed under Food, Simple Eats and was tagged with babaa, bananas, chuchi mulot, daun pandan, dessert, flour, gula melaka, malay, Nonya, Nyonya, pandan leaves, pengat, pengat pisang, Peranakan, salt, santan, straits chinese, sweet potatoes, thick coconut milk sauce. Always love your food photography and your detailed recipes. This dessert is truly and indulgence and I’m so in love with the dessert bowls, very pretty!